This is the third part of The Ultimate Guide to the Dodge & Burn Technique. Check out Part 1 and Part 2 where we talked about the fundamentals and tools. Today we finally get to one of the actual setup variations for the Dodge & Burn technique in Photoshop. But before we begin, I'd like to share a few words of caution with you. Form my teaching practice I have found that knowing the technique - the HOW-TO - never guarantees its successful implementation. In fact, when it's only the technique that a retoucher knows and nothing else to back up his or her retouching decisions - the results might be quite disappointing. With Dodge & Burn you must first understand what final result you're aiming to achieve with the technique. You need to know what looks good and believable, and what doesn't, because the most common mistakes are over-flattened faces or body parts and randomly manipulated shadows and highlights causing the shapes of the face or body become distorted and unrealistic. 2. Light distribution (physical) - understanding how the light distributes on forms (for beauty, fashion and portrait photography: on faces and body parts), understanding the qualities of hard and soft light in photography and being aware of the current lighting trends in the type of photography you're interested in. 3. Understanding the basics of light & shadow rendering in visual arts - with this knowledge you may be able to successfully correct forms by strategically applying new and/or replacing existing highlights and shadows. You also need this knowledge in connection with human anatomy not just simple shapes (cubes and spheres) from a basic painting class (like in the Part 1 of this article). 4. Being familiar with current Makeup artistry trends will also help to make the correct decisions when performing global dodging and burning (AKA "sculpting and contouring"), as well as overall beauty retouching. 5. Understanding the current trends in the beauty and fashion photography along with good sense of visual balance, great composition, good posing and framing - this is super important at the stage of selecting the image to retouch. All of the mentioned above, unfortunately, cannot be covered in an article. That would be enough material for a 2-year retouching course at an art school (hopefully there will be such formal courses for retouchers one day, fingers crossed for Retouching Academy!). Also, even when well-explained many of these skills won't help, they must be developed from within the artists' mind. It is your vision, your taste and even your personal color preferences that will influence your retouching. So, to start working on improving your vision, start observing more images by top-professionals in the industry, look at paintings, watch makeup tutorials, flip through beauty and fashion magazines, create a Pinboard for various types of images you're into. In fact, right after you finish reading this article, go register on Pinboard and create your first board - name it "Beauty & Makeup", or "Fashion Advertising by The Leading Global Brands", or "Top Clients in Skin Care & Makeup Industry" - and start pinning pictures from the top potential clients in the industry you're interested in. That's if you are aiming to be a successful commercial beauty or fashion photographer/retoucher. If you just want to be the best local portrait photographer find the top photographers who shoot portraits and pin their work to your board. Study their posing, framing and dissect their lighting. Do it regularly. I'll stress on it: the most important part of it all is to look at beautiful imagery or strong commercial work (whichever you are into) regularly. Here's my example: I have collected a few Pinterest boards for studio beauty photography, makeup ideas, hairstyling photography ideas, beauty images in jewelry advertising, etc. I revisit them on a regular basis, add new photos and remove those that I no longer find attractive or inspiring. My collections change and transform over the years along with my taste, vision and my own photography and retouching skills. I strongly believe every artist needs such modern "visual journals". Bottom line: knowing how to dodge and burn in Photoshop isn't going to make your work better. Improving your vision, taste in photography, correct skin tones preferences, understanding what looks good ALONG with practicing the technique - that is what will take your photography and retouching work to the next level. And now let's talk about the D&B setups in Photoshop. There are very many variations, but it all comes down to accurately lightening and darkening pixels on different layers and color correcting the areas where your manipulations caused color shifts. I will not attempt to give you all the existing setups that can be found out there - at the end of the day everyone of us can come up with our own - instead, I will focus on the two main setups that I myself and most of my colleagues use. Overall, Dodge & Burn can be arbitrarily subdivided into local (AKA micro, pixel-level) and global (AKA macro, sculpting & contouring). Each subdivision has its own goals and challenges. When we're performing local D&B we normally determine the area that needs corrections while being zoomed out. Then we zoom in very close (depending on the image and your screen size it can be anywhere from 60 to 200%) and work with the tools of our choice and in the particular setup of our choice. The main idea here is to even out the values of different parts of the skin to achieve that even surface look that we were talking about in the Part 1, remember? The conceptual difference between the two [local vs. global D&B] is obvious, and technically they are also different in the way the brush strokes are applied. Now that we understand the principal types and their differences, let's look at how D&B can be technically performed in Photoshop. This setup up can be used for both global and local D&B, however I personally prefer it for the local D&B mainly, and I will explain why a little later after we look at the other setup. 1. After you've cleaned up the skin with your basic retouching tools (such as Clone Stamp tool, Healing Brush, Spot Healing Brush, etc) and possibly some Frequency Separation add two Curves Adjustment layers on top of your PSD layer stack. 3. Name the other Curves Adjustment layer "Burn", pull the Curve down (darken in midtones) and cover it with a black layer mask as well. You don't want to pull the Curves too far away from their default position because then even with the lowest brush Opacity/Flow your brush strokes will be too intense, and we want very subtle changes, so we can build up the effects we are after with a few brush strokes for accuracy. So, here you go - your basic Curves D&B setup is done. From here on you will have to use your judgement based on your vision, experience and taste to determine which areas of skin need to be brightened and which areas need to be darkened to even out the surface of the skin. You will work with soft brushes (like the brushes you downloaded in Part 2 of this article) set to very low Opacity or Flow (again, see Part 2). For the setup I have illustrated above, I usually work with brush Opacity at around 3-5%, so if you pull your Curves away from their default position less than I did in my illustrations, you will be able to get away with a little higher Opacity (or Flow) for your brush as you are dodging and burning. One of the main challenges that retouchers deal with when dodging and burning is seeing those differences in values that need to be evened out. It is especially difficult for beginners to determine the areas to target. But don't worry, there's a way to help your eyes with this task. Wikipedia: Our retina is a light-sensitive layer of tissue, lining the inner surface of the eye. The optics of the eye create an image of the visual world on the retina, which serves much the same function as the film in a camera. Light striking the retina initiates a cascade of chemical and electrical events that ultimately trigger nerve impulses. These are sent to various visual centers of the brain through the fibers of the optic nerve. The retina is a layered structure with several layers of neurons and the only neurons that are directly sensitive to light are the photoreceptor cells: the rods and cones. Rods function mainly in dim light and provide black-and-white vision, while cones support daytime vision and the perception of color. The rods are also the most numerous and are more sensitive than the cones. *** If you enjoy learning about the biology of seeing, check out the Department of Physics and Astronomy of the Georgia State University: Light & Vision section. Disregard the fact that it is an ancient looking website, it shares a lot of great info that artists should know. So, due to the qualities of the photoreceptors in our retina - rods and cones - we can determine luminosity values much better in black & white when our powerful rods are enabled to do the main work. Thus, if we look at the photo we need to Dodge & Burn through a black & white layer - effectively turning off our cones (color-vision) and allowing the rods to judge what we're seeing - we can better determine the patches that need to be dodged and the patches that need to be burned. Add some contrast to the picture and you will see the differences in those values even better. From what I knew from my retoucher-friends most of them also used either Channel Mixer in Monochrome or Black & White adjustment layer as their help layers when Dodging & Burning. And as much as this layer was helpful, I often had a trouble with it when some areas of skin simply had a higher percentage of Reds rather than darker values. They needed to be color corrected and not dodged - they would look very dark through my help layer (since I darkened Red channel) and I would dodge them more than I needed to, causing even more trouble than there were in the original image. I always turn my help layers on and off as I progress, so I would catch those false targets for dodging and burning quickly, but some precious working time had been already wasted and more time was required to cancel out what I'd retouched and do it again properly. Disappointment. 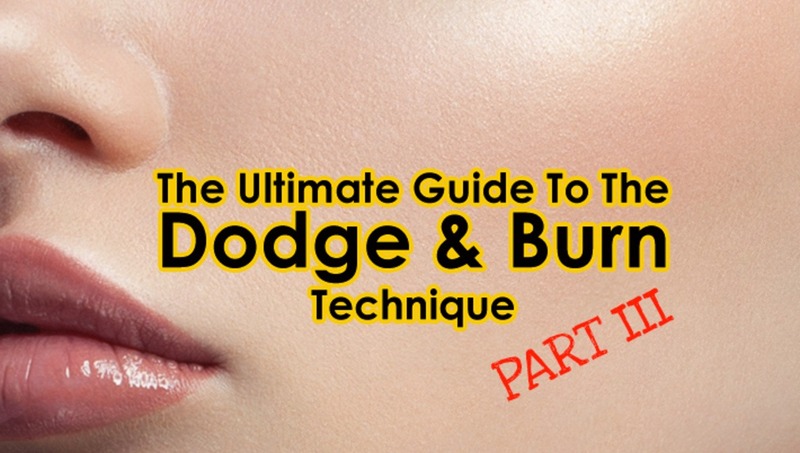 Some time ago I interviewed an amazing beauty retoucher from Vancouver Lulie Talmor, and in our chat she mentioned that she uses a different type of visual aid for Dodging and Burning. And because I admire Lulie's work I asked her to kindly explain what she does and why. 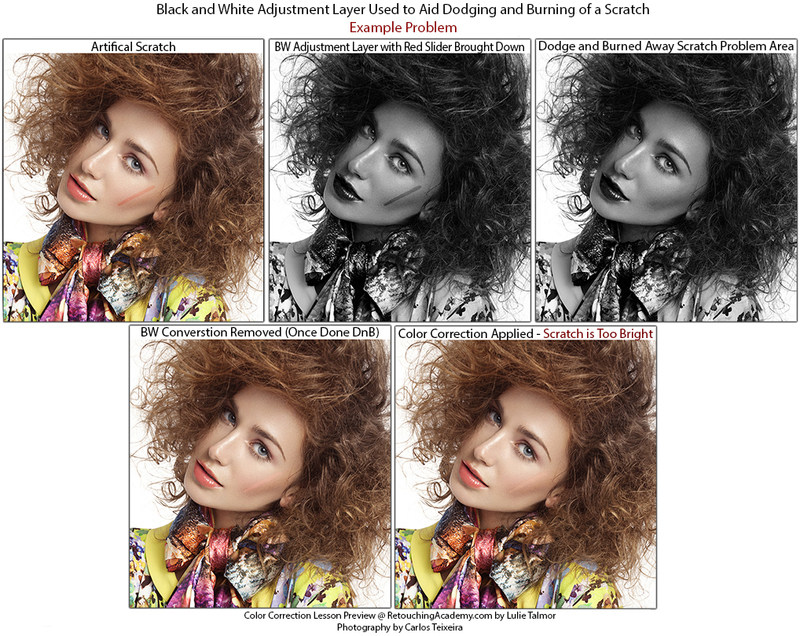 Lulie was kind and generous enough to invest her precious time into sharing a whole illustrated article on Black and White Conversions in Relation to Dodging and Burning with Retouching Academy readers. Lulie suggests a couple of different visual aid methods for accurate Dodging and Burning, and the best and the most correct one is using a 50% gray layer set to Color Blending mode on top of your D&B Curves. This conversion is similar to Black/White Adjustment Layer, except the luminosity value for each color cannot be adjusted, but is fixed to that which most closely represents the values the way the human eye perceives each color. For example, 100% saturated Blue is “darker” than 100% saturated Yellow. If you're interested to read more on this and see more of Lulie's examples, check out her article: Color Correction Lesson Preview: Black and White Conversions in Relation to Dodging and Burning on Retouching Academy. One step that is often missed by beginner retouchers is color correcting the dodged and burned areas. We won't go deep into this since it's a whole another topic, but I would like to bring it up, so you know that your retouching results will be better if you correct the colors you end up with after dodging and burning. The reason for this is that when you are brightening or darkening pixels, chances are their hues will shift. Usually, dodged areas may appear slightly less saturated than the surrounding non-dodged areas. And burned areas may appear a little over-saturated. Or they may be of just a different hue altogether. The best way to color correct such side-effects of Dodging & Burning is to use your favorite color-correction tools and layers (Hue/Saturation, Selective Color, new layer set to Color Blending mode, etc.) clipped to the D&B Curves - this way only the areas you have worked on will be affected by your color-correction layers. This is all for today, and, well, turns out it is still not the end of the story and I will cover one more Dodge & Burn method after I return from Australia in July. For my Australian readers - I will be presenting at the AIPP event in Gold Coast, QLD (Beauty Photography and Retouching) on the 9th of June. And after that my AIPP colleagues and I will travel to Sydney (June 12-13) and Melbourne (June 16-17) with 2-day Studio Beauty Photography workshops. Only a few spots left in each, hope to see you there! And for those who are not in Australia - Lulie Talmor and I will be hosting an online weekend workshop on Beauty Retouching: Skin & Skin Tones on the 12-13th of July. We also have only a few spots left there, so join us then! Hope you've enjoyed this part of this never-ending D&B sequel, share your thoughts and ideas in the comments and stay tuned for Part 4! Great article! thx for sharing, Julia! Where can i find more about Color Corrections After Dodging &amp; Burning? We will be covering that in our workshop, but I'm not sure if there's anything comprehensive on the web, I haven't seen anything really. If you find something, please let us know! Thanks Julia, your guides are always the best, flawless! I think you can avoid hue shifts caused by dodging and burning by setting those layers (lighten and darken curves) to luminosity blending mode. Gotta try that, but I'm afraid it'll still cause color shifts because it's not the manipulations that you do with the values that cause them, it's the initial color that is in the manipulated area that starts showing after you lighten or darken it. Haha, I'm just laughing at all the excellent stuff that is given away for free here. Funny to think that some people consider fstoppers greedy or whatnot - this has such quality to it that it's not even funny. Again, thank you Julia for helping photographers and retouchers see the possibility. I'd also like to make a request; as a high-school teacher of photography I often discuss with my students the art of retouching and how it affects how people view themselves. Retouching for some is a way to make themselves more confident in that they can see themselves as they "feel" they are, without the bad hair days, the lack of sleep, or temporary skin conditions. But retouching is also about setting weird (in)human standards. Men are supposed to look hard brushed steel with sandpaper skin, and women like peach skinned soft round fairytale elves, and as soon as someone start questioning these stereotypes of retouching or editing they get brushed off. I would love to hear your in-depth views on this issue. I know it might be controversial, but I think it's important, because in a way it limits ourselves as artists. Not because you "can't" do it any other way, but because if you don't, as an artist you will most likely not work. In the fashion industry if you refuse to do a certain type of skin retouch you're out of a job. I'd love to hear a professional's input on this, as a food for thought material for classroom discussions and a perspective on it. Hi Tobias, and thank you for your kind words! Oh, I am aware of the risks of getting into that whole ordeal. But I think the topic needs to be discussed and addressed, I mean, what happens if we don't? Hey Julia, fantastic article, thanks so much. Quick question: My dad's a prepress guy and he recommends setting up the D&amp;B curves in the green channel and setting the blend to lum. Do you have any experience with this? He's a funny resource because he'll drop something like that and not explain why he does it that way. In the curves dialogue itself, select the green channel from the drop down instead of setting points on the RGB channel. So you'd have to change the blend mode to luminosity or you'd have a green/magenta nightmare otherwise. I've done it and it seems to work nicely, but I figured a keener eye like yours might be able to see a benefit to doing it that way other than my "Oh ok... sure." outlook. Why is a prepress guy using RGB? I have my curves set up with the shadows to the left and highs to the right, and he goes the other way every single time he uses my machine. Simply love this series! It is definitely an essential read for all retouchers and photographers who want to master the art of retouching. Awesome series of Dodge and Burn! Congrats and thanks for sharing it with us :). I have a question that could help to speed up the D&amp;B workflow. I am just wondering if there is a simple way (for example a custom shortcut or action) for switching from the Dodge layer mask and burn layer mask and viceversa. When the 50% gray layer is used to D&amp;B this step is easy by change the color of the brush by pressing "X". I only found the way to Switch to layer below "Alt+[" and Switch to layer above "Alt+]" but it is not so comfortable in the keyboard and in mine (spanish one) there is no a way to do that because the keys that control the "[" and "]" comands are secondary options inside other keys. Hey Rafa. yes, I use X to switch between black and white always too. Just FYI - you can always re-program key shortcuts, and make Alt + [ something more convenient on the other side of the keyboard. For example, I re-programmed the brush size hot keys [ and ] into Q and A. You dodge and burn in a darkroom. You manipulate with digital. They are not the same thing. A great set of articles, Julia. You outdid yourself! One question: Would desaturation with a hue/sat layer work the same way as the 50% grey layer in luminance mode? What do you think? Can you please make the dropbox download link for the brushes available again? thank you!! Hey Julia - just went through 1,2,3... excellent for someone like me, who is starting to retouch his own photos. Are you still planning on part 4? Fantastic and detailed article. Thanks a lot for sharing!